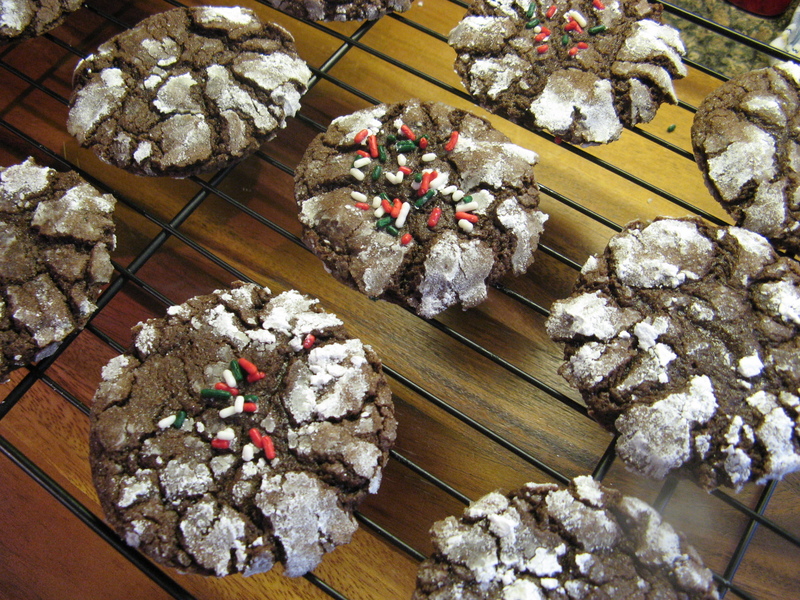 The Christmas Cookie fun continues with today’s Chocolate Crinkles. Now, I know the cookie recipes I’ve posted earlier – Rosemary and Pine Nut Cookies and Orange Scented Elephant Ears – aren’t your traditional holiday cookie recipes, but, these are definitely in line with what you see around the holidays. I’ve seen recipes for these cookies for quite some time, I probably have 1 or 2 saved in my recipe binder, but, it wasn’t until I was flipping through a Christmas Cookie recipe magazine recently that I finally decided to try them out and I wish I had tried them sooner. They are a cinch to make and delicious… Chocolatey without being overpowering. 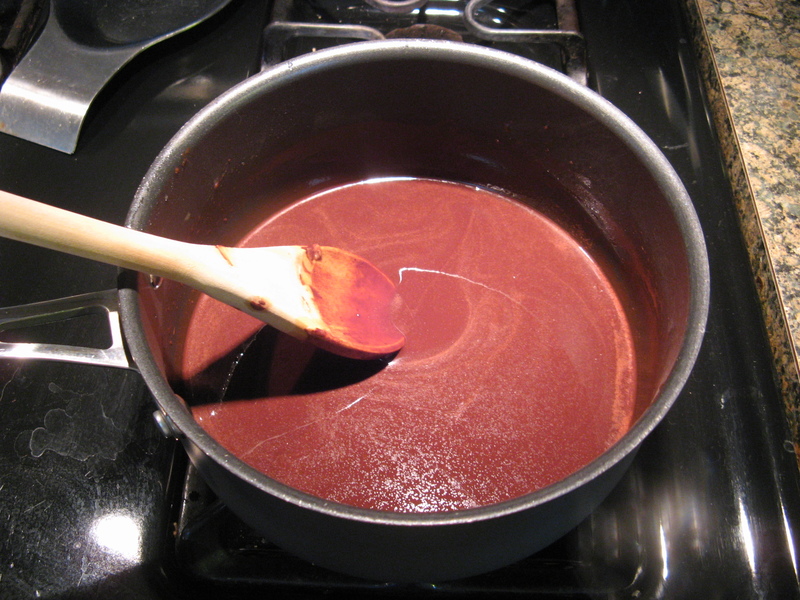 I started off by melting unsweetened chocolate, shortening and butter over low heat in a medium saucepan. 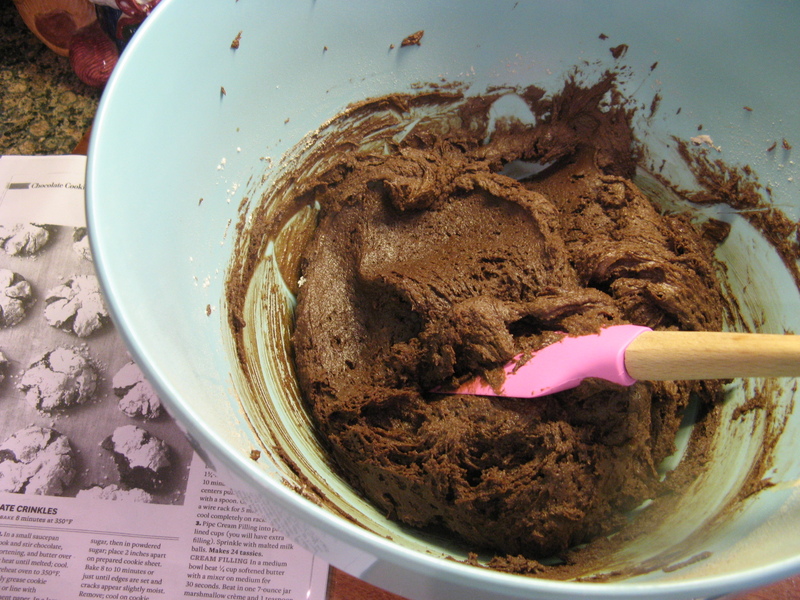 After letting the chocolate mixture cool for a few minutes I continued making the dough for the cookies by mixing together eggs, sugar, baking powder, baking soda and salt. 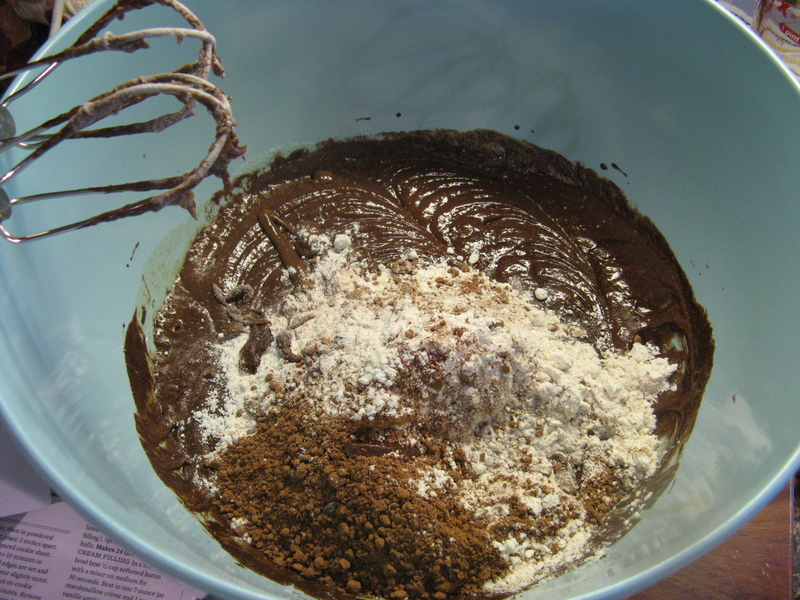 Once that was well mixed I then added in the melted chocolate and vanilla extract and finally flour and unsweetened cocoa powder. It wasn’t long before the dough had come together. To make sure all of the ingredients had incorporated I gave the dough a few good folds using a spatula. Using a cookie scoop I scooped up the dough and shaped it into a ball and then rolled it in granulated sugar and then confectioners’ sugar. 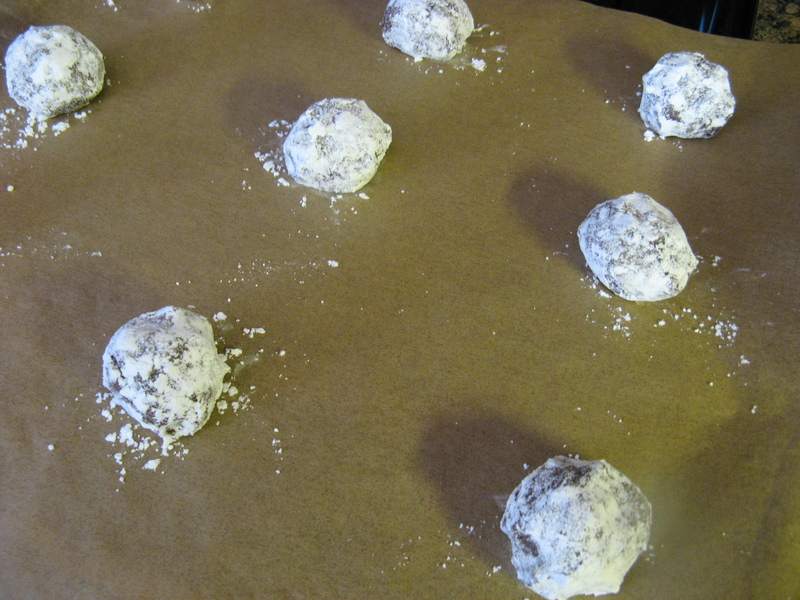 I then placed them on a parchment lined cookie sheet. 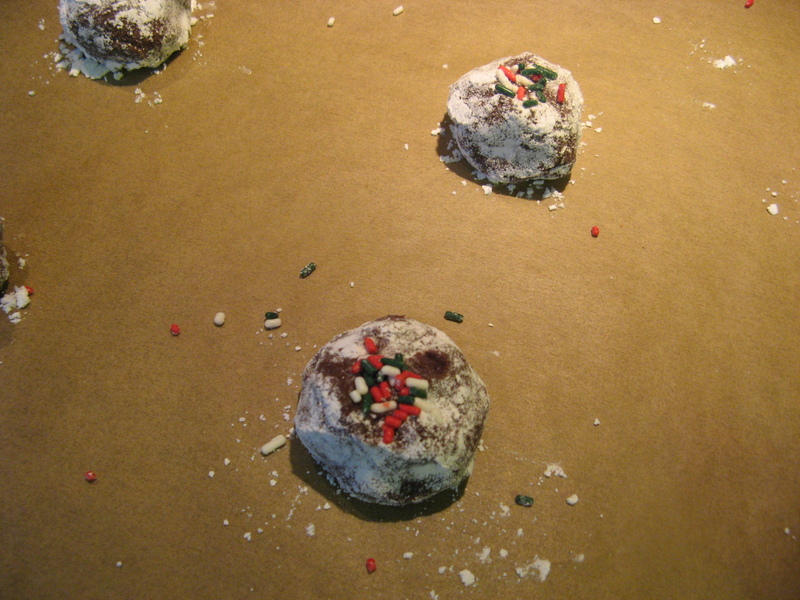 To give some of the cookies a festive touch I sprinkled them with red, green and white sprinkles. After baking them in a 350 F preheated oven for 8 minutes, I let them cool on the pan for a few minutes before transferring them to a wire rack to cool completely. While the recipe says to bake them for 8-10 minutes, I always like to bake my cookies on the lower end of the time span to ensure that I don’t end up with cookies that are like rocks. Letting them sit on the hot pan for a few minutes allows them to cook and set for a few more minutes. At first I thought I may have removed these cookies from the oven too soon, but, as they continued to cool on the wire rack they firmed up more and the texture of the cookie was spot-on. A little crisp on the outside and completely soft on the inside! Preheat oven to 350 F and line cookie sheets with parchment paper. Over low heat in a medium saucepan melt the chocolate, shortening and butter. Let cool. 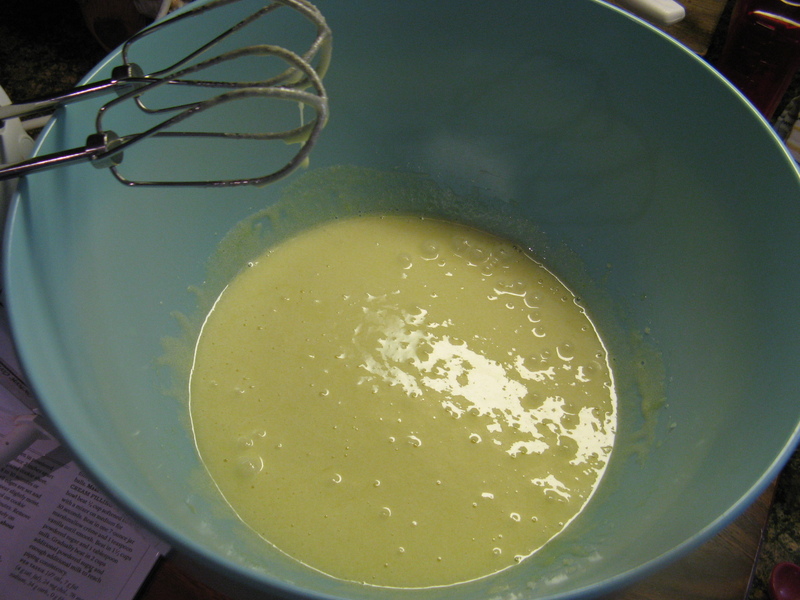 In a large bowl combine eggs, granulated sugar, baking powder, baking soda and salt. Stir in the melted chocolate and vanilla extract. And then stir in the flour and cocoa powder. Using a cookie scoop, scoop out dough and shape into balls and roll the ball in the granulated sugar and then the confectioners’ sugar. Place 2 inches apart on the prepared cookie sheets. Bake 8 to 10 minutes or just until edges are set and the cracks appear slightly moist. Cool on the sheet for 2 minutes and then transfer to a wire rack to cool completely.